Just a few short years ago, things weren't looking too good for Edd and Cynthia. They had enjoyed long successful careers. But the recession meant concession. They had been downsized once before…and were working in sales jobs in Las Vegas when Cynthia was downsized for the second time. "We saw the value of our savings plunge just as we were nearing retirement age. Rather than remain in the States and continue to work for too many more years trying to correct this problem we made the decision to relocate so we could retire and enjoy the rest of our lives," Edd says. In order to do this, though, they'd need to move to a place with a lower cost of living. After lots of research (and yes, soul searching, too), they decided on Ecuador. Drawn by the fact that Ecuador is close to the U.S. (just a four-hour flight from Miami), has near-perfect weather and a substantially lower cost of living, Edd and Cynthia found their way to the southern Ecuador city of Cuenca. "These are the best years we have left, and we're acutely aware that if we fritter that time away, shame on us. In Ecuador, we have the time and money to do the things we want to do. We live very well on about $1,900 a month (including rent), and that's with extras we once considered luxuries." Before they left the States, Edd says, most of their friends didn't understand their decision. They asked him, "What are you going to do there?" The short answer, he says, was, "Within reason, whatever I want to do." He says he and Cynthia had spent most of their adult lives preparing, going to and from, and doing a variety of things that were necessary to provide the financial support their family required. "And no complaints," Edd says, "I'd do it all again. But now…by moving to Ecuador, we've placed ourselves in a position to pursue a different path—enjoying things we've always wanted to do." "We can live a very comfortable retirement on our savings and small income here," Edd says. "And the truth is that even if we win the lottery, we can't imagine living anywhere else. Life here is that good." Looking to start a business? Raise a family in a more family-oriented, down-to-earth environment? Ecuador may be the perfect place for you. As Edd will tell you, Ecuador has thrown out the welcome mat to foreign retirees—as well as to those not yet ready to retire who are going to Ecuador in search of opportunity. The slower pace of life and the real sense of community are attractive to everyone, including young families who are finding Ecuador a wonderful place to raise their children. And it's not just Cuenca that's attracting foreigners…places like the bustling capital city of Quito, the medium-sized city of Loaja…charming rural Vilcabamba and other safe, small-towns like Cotacachi and seaside Salinas and more…are all worthy of attention. Salinas is where Jim and Rita Santos live. There, they say, they can enjoy the sunshine and temperate climate any day of the year. Can You Live in Ecuador on $1,000 a Month? "Yes," says International Living editor Suzan Haskins, "I know people who are doing that—mostly in small towns where costs are lower. Most expats spend a bit more." In an informal survey of expats in Cuenca not long ago, the average monthly budget per couple comes in at a bit less than $1,500—and that includes rent. But don't forget that when you first move to Ecuador, you'll need a couple months of reserve funds to get started… to cover rental deposits, visa/legal fees, household items you may need to buy, and so on. "Back on the eastern seaboard in the States in February, it's icy cold," Jim says, "but, here in Salinas it will be just below 80 degrees F, with a cool ocean breeze. Sometimes we think we must be dreaming. A little over two years ago, we were living in Maryland… and the idea of living beside the ocean was an impossible dream. The Atlantic Coast of the U.S. can be very expensive. If we wanted to walk on the beach in February in the U.S., we would have to buy a multi-million-dollar home deep in southern Florida. We certainly didn't have that kind of money. "So who would have thought we could not only live in a beachfront home, but that we would actually save money by moving there?" Best of all, as Jim reports, when you move to Ecuador you may find that you'll be not only happier than ever, but healthier than ever. "I have Type II diabetes," he says, "and before I moved to Ecuador, my A1C number that reflects blood sugar levels was close to 8—well above the normal range. After we settled into our lives in Ecuador, we found ourselves taking long walks on the beach and to the mercado for our fresh fruits, vegetables, rice, eggs and seafood. The stress melted away. And when we returned to the States a few months later for a family visit, I stopped in to see my doctor. "She ran some tests and then asked, 'What changes did we make in your medication since your last visit?' I told her we didn't "change" anything, I just moved to Ecuador. But I've now lost 50 pounds, my blood pressure reading was normal, and my A1C blood sugar reading was 5.7, well within the normal range, so I was able to stop taking one of my diabetes medications. "It was a very good feeling to have actual proof that we're not only living a happier, more affordable life, but also a healthier one here in Ecuador." Fortunately, in Ecuador, you'll no longer have to worry about having enough money to do the things you want to do. "We can live a very comfortable retirement on our savings and small income here," as Edd Staton says. "And the truth is that even if we win the lottery, we can't imagine living anywhere else. Life here is that good." Why Would You Want to Choose Ecuador? A couple can live well on $1,500 to 2,000 a month or less. Real estate prices are amazingly low! For these reasons and more, a growing number of expats are now calling Ecuador home. It may just be the "find of the century," they say, for anyone who wants to live life like it's meant to be lived…fresh air and a perfect climate, deliciously healthy food, and the warmest, kindest, most generous people as neighbors. That's why, for nearly two decades now, International Living has been recommending Ecuador as a top retirement destination. For most of the past decade, it has ranked in the top one or two spots on our annual Global Retirement Index. International Living's expertise in all things Ecuador runs deep. Many of our top editors, in fact, have ties to Ecuador. Real estate expert Margaret Summerfield has called Ecuador "one of the best, cheapest places in the world to buy beach property." Investor Ronan McMahon has owned property there. So have International Living senior editors Dan Prescher and Suzan Haskins. I myself have traveled to Ecuador well more than half a dozen times in the last couple of years. 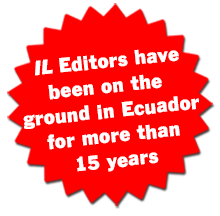 I can safely say that International Living has more experience and more contacts…knows more long-time expats and local experts in Ecuador than does any other website or publication. your hand every step of the way. Come away with all the knowledge and contacts necessary to make your move happen with confidence. If you couldn't attend the International Living conference in Ecuador this year, we understand. But the Fast Track Ecuador Package is the next best thing. You see, we're putting together a complete video package of all the recordings of every one of the 33 presentations at this conference. These recordings will be an invaluable research resource for you, but they may very well pay for themselves. One tip you can't get anywhere else…one piece of hard-won advice…one expert recommendation…can potentially save you tons of money and lots of headaches before and/or when you get your own boots on the ground in Ecuador. And you can order your Fast Track Ecuador Package now for a fraction of the cost spent by those attending the conference in person. And if you've read this far, I've got a feeling that you may have something in common with Jim and Rita Santos or Edd and Cynthia Staton or even with Wendy DeChambeau who moved to Ecuador with her husband, David, and their two young children to experience a "true foreign culture immersion." Moving overseas isn't without challenges—and this package will help you prepare for all the details. Here's what one of your fellow readers said about our most recent Ecuador conference: "The sessions were incredibly helpful! I believe that any questions I had were answered…and now I know whom to call if I get serious about living in Ecuador." Maybe you're still trying to catch up from the economic downturn of a few years ago, and you're finding that politicians and governments don't seem to be doing anything to help. If you're concerned about your financial future or your health…wondering whether you'll be able to have the kind of retirement lifestyle you dream about…wondering if you'll be able to afford to retire at all…you really should consider the 2017 Fast Track Ecuador Package—where you'll discover all about the benefits, cost-savings, opportunities, advantages (and yes, challenges) this country has to offer. There are so many benefits to living in Ecuador, in fact, that I certainly can't go into all of them here. And surprisingly, the low cost of living isn't the number one reason most expats in Ecuador give for living there. To a person, they credit the sweetness and kindness of the Ecuadorian people themselves. 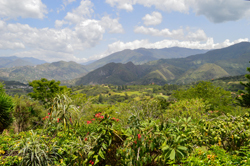 Vilcabamba—the Valley of Longevity—is one of Ecuador's most peaceful, healthiest places to live. "Ecuadorians are about the nicest people you'll find, says an expat friend who lives in the small charming village of Vilcabamba, "We live on a dirt road amongst the locals… they are some of the wealthiest people I know… they just don't have a lot of money, but they always have time to say hello." Of course, say other expats, the low cost of living is a huge benefit. Full-course meals (soup, an entrée of chicken or beef served with salad and rice, and dessert) for $3 or less—and that's with a fresh juice included! And with $3 haircuts, $1 beers, 25-cent bus rides, and $20 doctor's visits, why would anyone want to live anywhere else? And if you're worried that you'll miss your family and friends when you move to Ecuador, remember that with the money you save you can afford to go back for frequent visits…not to mention the low cost of hosting your visitors in Ecuador. As Edd Staton says, he and Cynthia expect to see their grandkids more because they've lowered their monthly expenses and they're no longer tied to jobs. "If we were still working in the U.S.," he says, "we'd have three or four weeks vacation a year and hope we had enough money to visit. Plus, our two children live in different states, so there's no way we could live near both of them simultaneously. Therefore some form of travel would always be necessary even if we still lived in the U.S."
Of all the places in the world International Living covers, Ecuador offers one of the lowest costs of living, hands down. "These are the best years we have left, and we're acutely aware that if we fritter that time away, shame on us. In Ecuador, we have the time and money to do the things we want to do. In Cuenca, my wife and I live very well on about $1,950 a month (including rent), and that's with extras we once considered luxuries." Your cost of living will depend on your personal needs, of course. If you buy imported goods at the upscale supermarkets, for instance, you'll spend more than if you shop at the farmer's markets. If you enjoy fine wines and spirits, you'll certainly spend more than someone who abstains from alcohol. And if you live at the beach, you'll probably want air conditioning for part of the year whereas in the highlands you won't need either heat or air conditioning. While we know some expat singles and couples who are living quite happily on $1,000 a month or even less, I'd say they're the exception and not the rule. Edd and Cynthia admit that they spend a bit more than most expats. "We live in a gorgeous two-story penthouse apartment," Edd says, "It's about 3,000 square feet, and we have four bedrooms, four-and-a-half baths, and expansive windows with a beautiful 270-degree view. "Our budget includes all the regular expenses and more—fresh flowers, gym membership, massages, manicures and pedicures, and hair care for Cynthia." Plus, Edd says, this includes doctor visits. "You usually get an appointment the same day you call, and they generally cost $25—and follow-ups are free!" So can a couple live well in Ecuador on $1,500 to $2,000 a month? The answer is absolutely yes. And you'll hear much more about the realistic cost of living in various parts of the country in the 2017 Fast Track Ecuador Package. What should you budget for rent? In small towns like Vilcabamba or coastal Crucita, small furnished rentals start at about $300 a month. Larger homes and apartments will cost more. In Cuenca and more populated coastal locations such as Salinas, most expats spend $350 and up for a long-term furnished rental with the average being about $450 to $500. Why are costs so low in Ecuador? Good question. Maybe the answer is that in Ecuador, goods and services cost what they should cost—and they're overpriced elsewhere in the world. 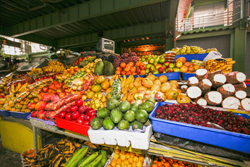 Ecuador's mercados are filled with fresh produce—fill up your shopping bag for $10 or less..
And food in Ecuador commonly comes straight from the producer…except, of course, for fancy imported packaged items (which you can get in the country's modern supermarkets). Also, Ecuador is an oil-producing country, so gasoline and transportation costs are low. Vehicle gas is less than $1.50 a gallon. A taxi ride in Quito or Cuenca typically costs no more than $2 to $5 anywhere in town. For now, the government subsidizes propane costs, and a 14-lb. tank to heat your stove and water for a month costs just $2.50. (That's delivered to your door—it's $1.60 if you fetch it yourself.) Those prices are expected to slowly creep upwards in the coming years… but not by too much. What about property taxes? Those are low, too. Friends I know in Cotacachi pay less than $56 for their 1,100-square-foot condo. And yes, that's per year. As you can see, it's easy to live affordably in Ecuador. Think about it… In 2017, the average U.S. Social Security check for a retired worker was about $1,360 a month. In Ecuador, that amount goes a long way toward covering your monthly expenses. If your spouse has a similar income, you may find yourselves with something left over each month. By the way, Ecuador's official currency is the U.S. dollar - so you needn't worry about complicated currency calculations or exchange risks. And real estate costs? They're among the lowest we've found anywhere in the world. It's always best to rent before you buy. That's the best way to find out if a city or town is right for your lifestyle. But if and when you do decide to buy a home in Ecuador, you'll be pleasantly surprised by the prices. Imagine… an older (but well-kept) three-bedroom condo with a city view for $52,500 or a brand-new two-bedroom/two-bath condo—with city views—for less than $90,000. A large three-bedroom hacienda-style home in the mountains for $98,000. A two-bedroom condo with views of the blue Pacific… just $94,000… or a huge four-bedroom/three-an-a-half bath villa in a small community with direct access to the beach with a large outdoor living area and gorgeous tropical gardens… just $249,000. You can certainly pay more, but these aren't just the lowest prices…these are typical prices! "Old Town" Quito was the first-ever city to be designated as a UNESCO World Heritage site, in 1978, and you won't find more traditional Spanish colonial-style architecture anywhere outside Spain itself… massively thick walls, high ceilings and romantic balconies. Huge wooden doors open from the street to reveal interior courtyards with cobblestone floors, tastefully decorated with lush greenery and bright flowers. Many of these have now been renovated into shops, restaurants, offices, and condos. A spacious 2,150-sq.-ft. home with six bedrooms and four-and-a-half bathrooms is for sale in the heart of Old Town, It needs a complete remodel, but it has gorgeous wood floors, iron-framed windows, and a pretty facade. It's selling now for just $75,000. In quiet Cotacachi, a leather artisan village about two hours north of Quito, for just $78,900, you can buy a two-bedroom, two-bath condo in the heart of town—fully furnished. A brand-new modern three-bedroom townhouse with a good-sized yard is selling for $85,000. And $154,900 gets you a gorgeous hacienda-style home with breathtaking views of the mountains in one of the most popular gated communities. And at the beach, you'll find similar bargains. Near Salinas, arguably Ecuador's most popular coastal playground, you'll find an oceanfront complex with a large pool, social area, fitness center, and direct beach access. You'll find a two-bedroom condo—with an ocean view—selling for just $90,000, fully furnished. Not far from the action in Salinas itself, you can pick up an oceanfront three-bedroom / two-bathroom condo for just $126,000. You'll find bargains like this all along the coast. Important Note: In Ecuador, foreigners are afforded all the rights of citizens when it comes to property ownership. Still, things are done a bit differently than they are at home. You need to understand the intricacies of property ownership in Ecuador and know who to turn to for legal help in order to safeguard your investments. There's so much information to share with you about Ecuador. And we'll do exactly that in the Fast Track Ecuador Package. Cuenca, about 275 miles south of Quito, is Ecuador's third-largest city, but its central historic district feels more like a small, charming old-world town, with tidy plazas, ancient churches, and cobblestone streets lined with tall colonial-era adobe-walled buildings transformed into small hotels, restaurants, and shops. It was declared a UNESCO World Heritage Site in 1999. Its infrastructure can't be beat, with drinkable tap water, good phone service, and inexpensive high-speed internet. And culture? Restaurants and cafes are numerous and diverse, and orchestra performances in the colonial Teatro Sucre are free to all… plus you'll find modern malls and supermarkets where you can buy just about anything that you can get back home. Medical and dental care is excellent and inexpensive. At one local private hospital in Cuenca, you'll pay just $35 for an extended appointment with a specialist. There are three excellent teaching hospitals in Cuenca, by the way, and many other smaller medical facilities. Many offer their own private health plans. There's a thriving and energetic expat community…with as many as 4,000 to 5,000 full-time expats in Cuenca (in a total population of almost 350,000), you can truly mix into and experience another culture. Just across from the Yanuncay River, a modern new three-bedroom/two-and-a-half bath condo with upscale touches like granite countertops and a private terrace can be had for just $139,000. It's a secure building and comes with two garage spaces. In the heart of the colonial center—just two blocks to Parque Calderon—you can pick up a gorgeous condo with a private patio that opens to a beautiful garden courtyard, selling fully furnished down to the wine glasses, for just $94,500. A completely new and modern home with pretty gardens in a gated community just 15 minutes from the city center offers 1,600 square feet of living space, with three bedrooms, two-and-a-half bathrooms, a two-car garage, and more… It's listed for just $144,000. Still Not Sure Ecuador is Right For You? Incentive: Low Costs for Excellent Healthcare. Name-brand medicines are much cheaper than in the U.S. Generics cost a fraction as much and availability is good. One expat we know tells us that one monthly medication he needs costs more than $60 in the U.S. and less than $30 in Ecuador. A month's supply of a general blood pressure medication, for example, costs about $85 in the U.S. and less than $30 in Ecuador. Dental work performed by highly skilled doctors is also widely available and inexpensive. Partial plates cost $325, and a complete set of dentures costs $900—including office visits, fittings, impressions, and lab work. In many dental offices, a cleaning is $30 or less while a filling costs $30. Unlike some countries, you can join Ecuador's IESS healthcare program no matter your age. And just now, as of April 2017, a new law ensures that private insurance companies in Ecuador must accept anyone who applies, regardless of age. And don't be afraid to have surgery here. Many specialists in Ecuador have trained in Europe or the U.S. and have top-notch skills—and costs are one-fifth to one-tenth what you'd pay in the U.S.
Health insurance, too, is a bargain in Ecuador—a tiny fraction of what you'd pay in the U.S. And while it still has its shortcomings, Ecuador has made improvements to its public healthcare system in recent years, and offers free healthcare and medications to all residents over age 65, including foreign residents. Many foreign residents have chosen to join Ecuador's Social Security system. If you're of retirement age, you'll likely pay just $70 to $80 a month for this. With healthcare so affordable, though, some expats choose to self-insure or to purchase an affordable private policy. It's rare that you'd pay more than $125 to $200 a month per person for a private policy! Want to learn more? You can when you order the 2017 Fast Track Ecuador Package. Ecuador is a peaceful country with a long-standing commitment to democracy. Just recently another democratic presidential election was held, and you can be sure, the new president and the government of Ecuador is committed to property rights in Ecuador. The country's new constitution, ratified seven years ago, restates that point. We'll show you exactly how to live a comfortable, laid-back lifestyle in Ecuador…even on a very modest budget. If you want to pursue your retirement dreams, retire even earlier than you thought you could, or just live a more luxurious life than you ever thought possible—then there's no better opportunity to gain access to so much expertise…than with the Fast Track Ecuador Package. See how little it really costs to live in Ecuador. Not via some theoretical budget, but from the people who are already doing it, living in every corner of the country. Discover the best places to live and buy or rent property, by seeing…via video…all the latest hot spots on the Ecuador real estate scene. Not from some agent's listing, but from International Living contacts who have traveled to or live in these areas. Find out what it takes to start up a business in Ecuador. Not from a book, but from expats like you who have done it themselves… and done it well. Understand exactly which documents you need to qualify for residence and Ecuador's healthcare system…and where to bank, which of your household items you can bring, the best place to buy insurance, go for medical care, take a laidback low-cost holiday etc. etc. Hear it straight from the attorneys, professionals, and others who are guiding your fellow expats. Discover how to finance your lifestyle in Ecuador. A special presentation will guide you to moneymaking opportunities you probably haven't considered—and using skills and knowledge you already have…and with little (even no) start-up costs! Get the whole picture, not just the fluff. Taxes, insurance, and visas are not the fun part of being an expat. But you need to know this part of the story before you take your first step in Ecuador. Our trusted professionals will deliver the information you need. —Those Who Have Gone Before You. In the Fast Track Ecuador Package, you'll see and hear from an unprecedented number of expats who have bought or rented homes, retired, or started a business here. Men and women who just a short time ago, were in the same position that you are today. Here are just a few of the people who make up our faculty for this groundbreaking package. International Living's Dan Prescher is the special projects director and media spokesperson for International Living, and no one is more qualified to talk about living overseas than Dan. He's traveled all over Latin America researching and writing about everything from deserted beaches to bustling world-class cities where life is good and costs are low. He and his wife, Suzan Haskins, are four-country expats and have lived in both Quito and Cotacachi, Ecuador. Alvaro and Camila are associates of Moreno di Donato, one of the leading law firms in Ecuador when it comes to expat issues such as immigration, real estate, banking, and more. They'll bring you up to speed with the practical information you need to know if you're planning to retire, buy a property, or start up business. Winton Churchill is founder of the Barefoot Consultants, an international training and consulting company that helps clients make a living from anywhere in the world by tapping into their own skills and career experience. "By taking charge of their earning power, rather than waiting for governments, financial institutions and employers to 'right themselves,' the baby boomer generation now has the power and access to put their skills and abilities on the global market regardless of where they live or work now," he says. Keeping far ahead of the pack when it comes to real estate markets, Margaret and her business partner, Ronan McMahon, have been the guiding force that led International Living readers to the explosive opportunities of recent years in Ecuador, Costa Rica, Mexico, Brazil, Nicaragua, Panama, and more. As Managing Director of Pathfinder, Ltd., International Living's preferred real estate advertising partner, Margaret will explain how to do your due diligence when buying real estate overseas. Sandra is an English-speaking Ecuadorian who has been working in the international cargo business for nearly 40 years. In 2005, she established Sanestar International Shipping Services to help individuals and businesses relocate to Ecuador. Sanestar features door-to-door service to any place in Ecuador and provides bilingual agents onsite to assist with shipping, customs, visa issues, etc. She can also help you import business equipment and supplies and is an expert in bringing pets to Ecuador. Ellen is a Dutch veterinarian. She trained in Belgium and has been living the international lifestyle since she was a child, living and working in Ecuador since 2001. She is an active member of AMVEPE (Ecuadorian small animal veterinary association) and of WSAVA (World Small Animal Association) where she is a board member. She and her husband, Dr. Germán Fierro, are owners, full-time veterinarians, and managers of Ecuavet and Vet2Home, veterinary services that serve Quito and its valleys. Oswaldo and his daughter, Julieta, are born-and-raised Ecuadorians. As owners of Nuevo Mundo Expeditions, the family is one of the country's best-known when it comes to the travel and hospitality industry. Oswaldo and Julieta will introduce you to Ecuador's best destinations…the well-known and the little-known…and Oswaldo will explain how to get there, where to stay, what to see, what to pay, and more. As a writer/editor for International Living for more than a dozen years now, Suzan has traveled extensively in Latin America, searching for the world's best and most affordable lifestyle opportunities. She has lived in Quito, Ecuador; Lake Chapala, San Miguel de Allende, Merida, Mexico; Panama City, Panama; San Juan del Sur, Nicaragua; and Cotacachi, Ecuador with her husband, Dan Prescher. She will share the challenges and rewards of the expat life in Ecuador in particular. Wendy and her husband David were looking for an alternative to the "American Dream." They wanted to own their own business and introduce their children to a new culture. In November 2011, Wendy, David, and their two sons arrived in Ecuador and set out to make their dreams a reality. They quickly opened and operated a restaurant in the town of Cotacachi while finding time to travel. After a year of business, Wendy and David sold the restaurant and began to focus on other opportunities. While they still live in Cotacachi, they also now own a farm in the up-and-coming Intag Valley. Wendy is International Living's Ecuador highlands correspondent. Learning Spanish for enjoyment and business. The truth about residence visas—how to qualify and what your obligations are. The ins and outs of buying property in Ecuador… buyer's and seller's obligations, property rights and estate laws, and more. Insurance and health plan needs: How to qualify for Ecuador's private health plans, the IESS Social Security program, and how much you might expect to pay. Our seasoned professional experts will deliver the on-target information you need to get the real picture about living, retiring, buying, or starting up a business in Ecuador. And yes, you'll hear from Jim and Rita Santos from Salinas. I've already told you some of their story. They purchased their oceanfront condo in March of 2013. Until recently, Jim continued to work remotely as a computer/network professional for a major government contractor in the U.S. With the low cost of living in Ecuador, however, he was able to take an early retirement. He is now International Living's Ecuador coastal correspondent. Elaine Yakos-LeBron will also share her story of moving to Manta as a retired single woman, where she says, "The weather is perfect, and the people are great. The locals are friendly and accommodating. And the expats are friendly, too. Thursday nights we meet for cocktails and dinner. Saturdays, up to 40-or-so people show up over the afternoon at a restaurant at the beach. There's a man's night, an afternoon stitch group, and the Red Hat Society is very big here. I love living in Manta." These successful expats are just the start. You'll also hear from Edd and Cynthia Staton from Cuenca and Jean-Claude, who will discuss his life in Vilcabamba. Joel Kaplan will share details of his life in Coatcachi. He and his wife, Kathy moved to Cotacachi five years ago with their daughter and then two-year-old granddaughter. This video package will give center stage to more expat speakers than ever before. They'll share their tips, tricks, and insights with you. They'll tell you the unvarnished truth about life in Ecuador…the good, bad, and the not-so-good. This information is worth its weight in gold. Just think about it. How much would you pay to travel around Ecuador on your own, arranging appointments with legal experts, real estate professional, tax specialists, and expats who've been there, done that? But don't worry—you don't have to do this on your own, we've done the heavy lifting for you and you can explore Ecuador from the comfort of your own home. You'll see all sides of Ecuador. From luxury living to a comfortable and enjoyable way of life that you can manage on a social security check…from the lush green mountains to the dazzling beaches and everything in between. You'll find that this package will bring you up to speed on affordable lifestyles that you didn't know about before. Think about it. If you gather this information on your own, you'll spend thousands of dollars, and months of your time. Knock on doors, search the internet, sit in lawyers' offices, and hang out with real estate agents, it will be impossible to assemble the body of knowledge and contacts that we've pulled together for this package. Frankly, our Fast Track Ecuador Package is a good investment of time and money for anyone who's considering making a life in Ecuador…. Reserve the Fast Track Ecuador Package now and we'll send you via e-mail one of the most valuable reports about Ecuador we've ever developed. This special up-to-date report—The Five Top Ecuador Destinations Where You Can Live Better for Less—was created specifically to deliver actionable information and real examples about life in Ecuador and the best destinations for expats to consider. You already know that we believe Ecuador is one of the best retirement destinations in Latin America…the most affordable overall and certainly with some of the lowest real estate prices…hands-down the best. But there are lots of options to choose from… and unless you have unlimited funds you'll want to know as much as possible about each of them. The Five Top Ecuador Destinations Where You Can Live Better for Less will be rushed to you immediately when you reserve this package. This valuable report is only available to 2017 Fast Track Ecuador Conference attendees and to you when you order the Fast Track Ecuador Package. It will not be offered for sale. The full price to attend the International Living Fast Track Ecuador: Lifestyle and Opportunity Conference was $1,195. However, you can secure yourself a copy of the 2017 Fast Track Ecuador Package for only $424…a mere fraction of what attendees paid to join us in Quito. And with this package, you'll have the distinct advantage over those attending the conference in person: You can watch it at your leisure…skip around to the presentations that interest you most, take notes… And more importantly, you can access the recordings as many times as you like, so you don't miss a thing. The important information, the secrets and briefings, will all be captured in the 2017 Fast Track Ecuador Package and we want to make it as accessible as possible for you. To sweeten the deal, we're throwing in a $100 voucher toward any upcoming International Living conference. Use it to attend any future conference you may be interested in. There is no expiration date on this voucher. A $100 voucher toward any of our future conferences anywhere, any time. Plus a special bonus report, titled: The Five Top Ecuador Destinations Where You Can Live Better for Less. You have nothing to lose: You can call us within 30 days of receiving the 2017 Fast Track Ecuador Package and tell us the information didn't help you. (Or don't tell us anything. Just ask for your money back.) We'll give you back your $424. And the Special Report and your $100 voucher, good toward any future conference, is still yours to keep. If you're serious about tapping into the opportunities still available in Ecuador, I urge you to reserve your 2017 Fast Track Ecuador Package now, using our secure online order form. …this Fast Track Ecuador Package will deliver.